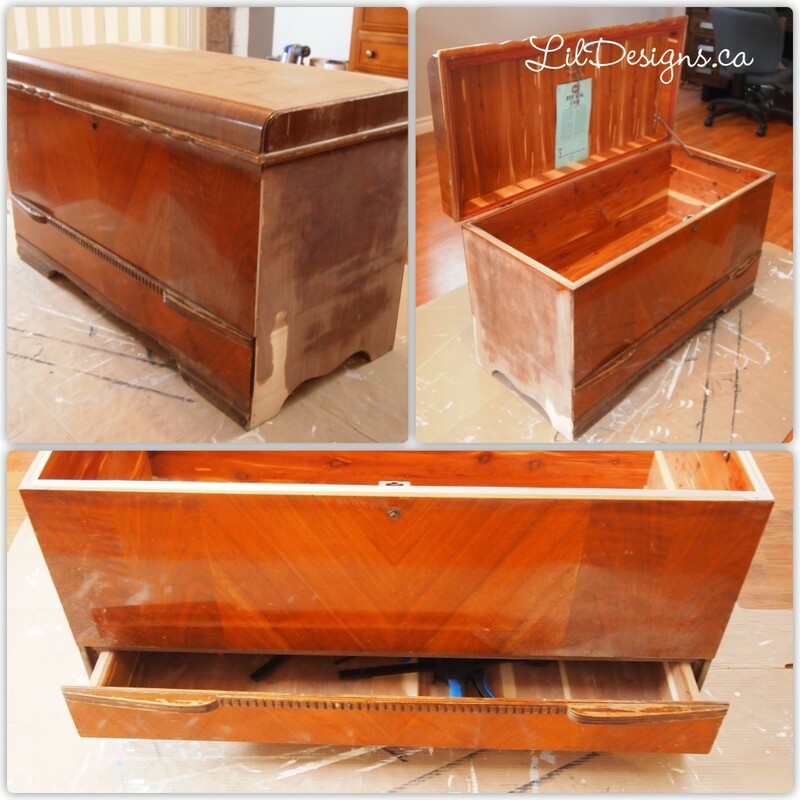 Hubby and I found another one of these Authentic Cedar Chest by Honderich Furniture. How Lucky!! The chest still had the original Honderich stamp and the original $100.00 moth insurance certificate stapled on the inside of the lid. Just a bit of history behind these beaut’s. In 1911, C.R. Honderich and sons and August Eidt, founded the H.E. Furniture Company. In 1917, the firm added cedar chests to their line. In 1926, the H.E. Furniture Company became the Honderich Furniture Company. The furniture was primarily constructed using solid walnut and walnut veneers. In 1967 the factory was sold to Messrs. Dow and Kirkham (Fry & Blackhall, Wingham) who operated it under the Honderich name. In 1969, the plant was sold to Electrohome. It was in Milverton, Ontario. For this piece I decided on the Annie Sloan Pure White colour. I think this colour helps retain the pureness of this antique chest. With the Natural finish showing through the distressing, it added just the right amount of antique with a touch of modern. 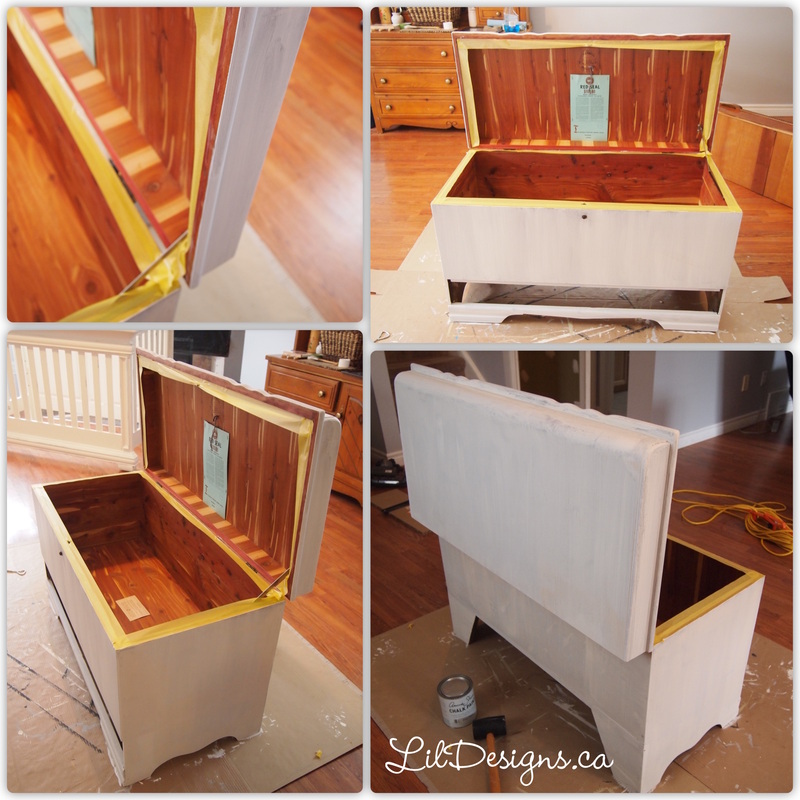 I LOVE these cedar chests! 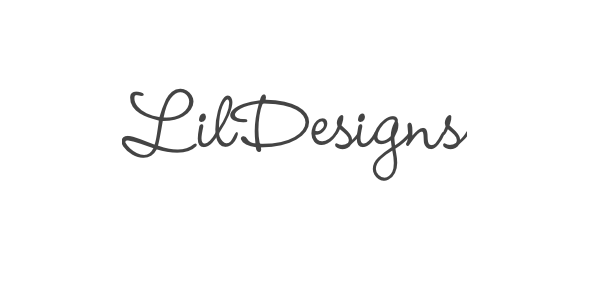 Not only do they smell absolutely wonderful when opened, they are perfect for any decor to store your extra throw pillows, blankets or other knick-knacks! 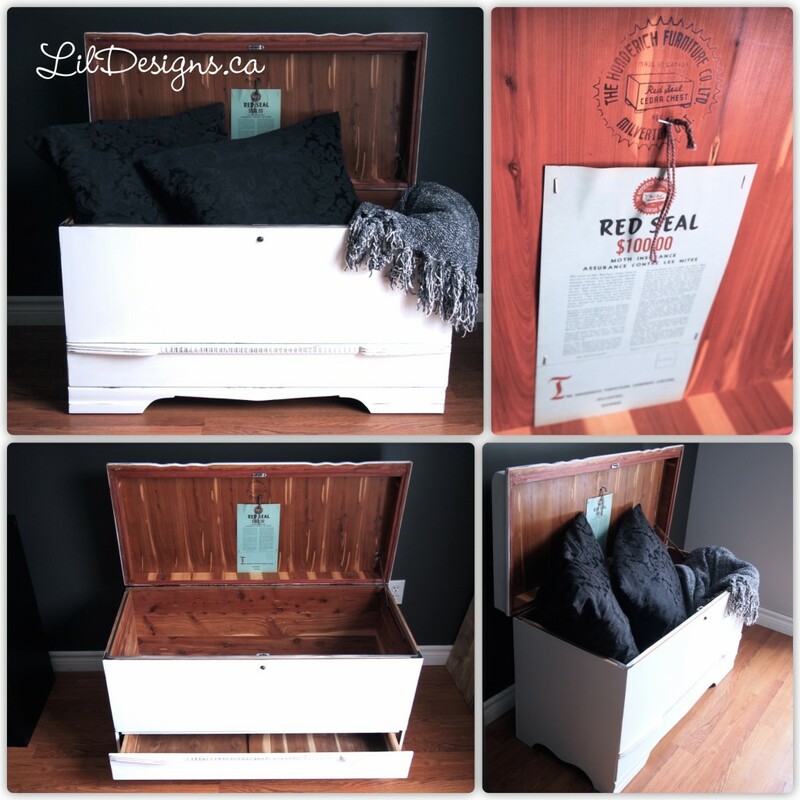 This entry was posted in Crafts & DIY and tagged annie sloan, antique, ascp, Cedar Chest, chalk paint, furniture, honderich and co, pure white, red Seal. I bought a red seal honderich cedar chest as well. It’s beautiful, want to paint it as I refinish furniture but is alao afraid it might be a antique and don’t want to depreciate it. Is there a site where I can send you a picture? Hi there. We’ve got one that has been locked and we’ve lost the key. Would it be possible for one of you folks that has a key to take a photo and send it to me? This would help me to try to jerry-rig some sort of tool to pick the lock! Hi Dan! Unfortunately, the pieces are sold and I no longer have them in my possession. For many of them there is a button, in lieu of a lock. Push in the button and the lid is released. I have a key! Do you still need a picture!? I thought mine was locked. But then I remembered it’s a push button like previous comment. No need for a key. Just doing some reading about my chest as I contemplate selling it or keeping it. Mine has a red metal crest nailed into the lid that says: H.E. Furniture Company. According to the information you provided above, my chest must be 91-100 years old. It belonged to my great aunt and I inherited it when she passed away in 1980. It is still in stunning condition on the inside–smells amazing–but the outside has seen better days. I wish I knew how old it was when I started carting it all over everywhere with me. Is there a web site or other source of information about these chests that you could pass along to me? I’m wondering just how special this chest really is.